The Elizabeth Engraved Charm necklace is a beautiful engraved sterling silver charm pendant on a silver plated chain. The charms are also available in rose gold vermeil finish. Children's length chains and additional charms are available. 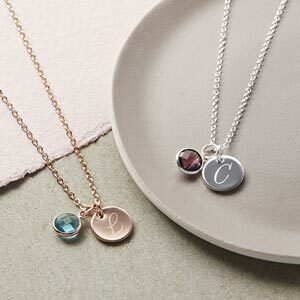 This delicate personalised necklace includes a beautifully engraved charm. This bespoke necklace can have several engraved charms added to create an individual look. 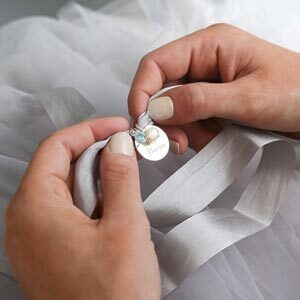 Mini engraved name charms are engraved with up to 8 characters including spaces. For that extra special touch why not add luxury packaging, a Swarovski birth stone or upgrade your chain to sterling silver. Please note that engraving more than one charm has an extra charge and this must be selected from the drop down menu. Silver plated chain with sterling silver engraved charm pendant.